Battling Storm Doris, on a blustery February day, our faithful pilgrims continued the circuit of our city, from Methley to Carlton. We have not yet experienced rain, in six months of walking, but water continued to engage us as we crossed rivers and canals, and contemplated ideas of sacred springs. “I often think that the inner world is like a landscape. It is lovely to be on top of a mountain and to discover a spring well gushing forth from beneath the heavy rocks. Such a well has a long biography of darkness and silence. It suggests the archaic resources of consciousness awakening within us. With sudden freshness, new springs come alive within. In the Celtic world, wells were sacred places, thresholds between the dark, unknown subterranean world and the outer world of light and form. Anam Cara: spiritual wisdom from the Celtic World. John O’Donohue. p 114ff. Walking together through the landscape is one way we can slow down and be ready to receive blessing from the physicality and the metaphors present in the natural world around us. Transport and communications occupied our thoughts on this “wedge” of the walk. Three motorways thread through this patch, including the A1 link, built in 1999 east of the city (“One viaduct; two tunnels; thirty-seven bridges; eight underpasses, two footbridges; eighteen CCTV masts”) At one moment we could see the distant spires of both Wakefield Cathedral and Emley Moor communications tower: Tom spotted them first, but then he did gain an advantage by clambering up a nearby tree. We found no sacred wells. 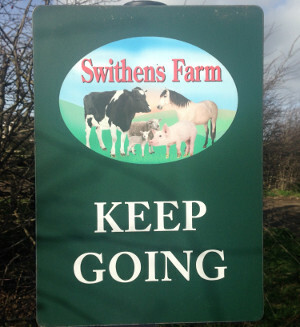 However, there was ample opportunity for refreshment of other kinds, if not at “Cheesecake Farm” which we passed, then certainly at Swithens Farm cafe, who gave us encouraging signs along the way. Here we celebrated the fact that, after six walks in six months, we have encircled half our city. We look forward to continuing on Wednesday, March 22nd, so if you’d like to join us, you would be most welcome.